As part of the Claude & Camille event for the Historical Fiction Bloggers Round Table, I bring you a guest post written by author Stephanie Cowell. 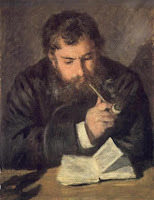 I like this picture of Monet by his dear friend Auguste Renoir who used to come out for many days at a time to visit Claude in his house in Argenteuil. And I wondered to myself, “Can Claude perhaps be reading a historical novel?” Perhaps, if he was reading a book by Victor Hugo or Dumas. On the chat groups for historical fiction writers, the subject which arises again and again (always drawing the cyberspace equivalent of blood) of how much the historical novelist is allowed to invent. This has a very wide range of course. I remember someone online saying, “Why so and so knows so much about this famous historical man, he knows the color of his nose hair!” I thought that was a little extreme. I have never been puzzled about that detail in any character in a book. On the other hand, I always have characters looking for clean clothes! So writing a novel about people who really lived is a challenge. First of all, you have to create a rising plot line for the story and most of us live daily repetitive lives with many tangled plot lines and much of the mundane and that is the same for any character. Historical novels deal with crafted plot; they are meant to make Anne Boleyn or Mozart or Josephine spring to life so that you feel you are in the same room with them and that room has to be vivid. Each novelist will choose different aspects or events for their character, just as my two sisters and I see the life of our father and what sort of man he was differently. As authors, our view of these characters will be different from another writer’s view. But they must come alive for the reader. So we take a person who once really lived and blend fact and fiction and love and skill and hope it will speak to some readers. I am always happy to send my readers names of good historical biographies so they can make their own interpretation of intriguing people from times past. Thank you Stephanie for such an entertaining and informative post. I have very much enjoyed having you on Passages to the Past! REMEMBER: Click HERE to enter to win a copy of Cowell's Claude & Camille! One of the things I find a bit annoying about many fictional biographies of famous historical people is, that the writers of these pieces fail to create a story arc. They get so involved with the mundane parts of these people's lives, that they forget that a novel has to have a beginning, a middle and an end or resolution of some kind. There are some good fictional biographies that (a) either pick a particular pint in Famous Person's life and create a story from that, or they are able to leave out (most) of the "mundane" stuff and concentrate on pivotal events in that person's life, or they use some other techniques for creating a story arc(like, for example, having someone close to the Famous Person actually narrating the story). This last doesn't always come off, and IMO it takes a pretty skilled author to bring them off. Unfortunately, many writers who write or want to write historical fiction, think it's easier to take a Famous Person and write their story, because all they have to do is "flesh out" their lives. I've seen all too much of this, and quite frankly, that's why I don't read a lot of historical biographies any more. Having said that, I think you are absolutely right that is essential for the writer to create some kind of coherent story arc. The "fictional" part can come from your own conclusions about why Famous Person did what s/he did in any particular situation -- we can never know for sure, and these are basically interpretations. It's also harder, much harder, I think, to write about writers and artists, because much of their lives were "interior"(where else do you think their writing and artistry and musicianship came from? ), although one story arc for these people might be the clash between the "interior" v. the "exterior", especially if you're writing certain types of literary fiction. With "political" people, it's actually easier, especially with those figures about whom a lot has been written -- though even here, it's hard to write yet another novel about Elizabeth I or GEorge Washington or someone of that character. Be that all as it may, your advice and thoughts around this subject are really very good. A great post - truly this topic is one that comes up again and again in discussions. great post by Stephanie! I do enjoy good historical fiction, and I like it even better if the author sticks to the facts as much as they can. But whose to know what truly happened and how these people really behaved? Thats where the authors talent with storytelling shines through. When I read an historical novel, I expect a certain degree of accuracy. Of course, one can't expect many personal details unless someone left a detailed personal diary. An author who is knowledgeable of the era and the main characters should be able to do a fairly good job of creating dialogue and events. It is a work of fiction not straight history. And from what I have been reading in history non-fiction lately, even a lot of what we thought was true isn't. That was a very relevant post, and writers of historical fiction should be careful to keep this in mind. Loved the pictures that accompanied this I bet he is read a HF novel. Very good comments, Stephanie. I especially liked the comment about having to make the characters spring to life. I imagine they often thought their lives were exceedingly mundane, but as novelists we can never think so.